Natural gas companies are selling gas to North American customers for peanuts when they could be getting much higher prices internationally. However, it is currently not possible to ship natural gas from the U.S. to the rest of the world. That will change over the next few years with the completion of multiple natural gas liquefaction plants. I've already revealed mysecret to commodities investing and an alternative way invest in increased natural gas production. Read along, and I'll explain why liquefied natural gas, or LNG, is a game changer, how it will affect natural gas companies, and a dividend stock to profit from LNG's expansion. Currently there is a rush to secure drilling leases in the U.S., which is keeping natural gas supply higher than demand. 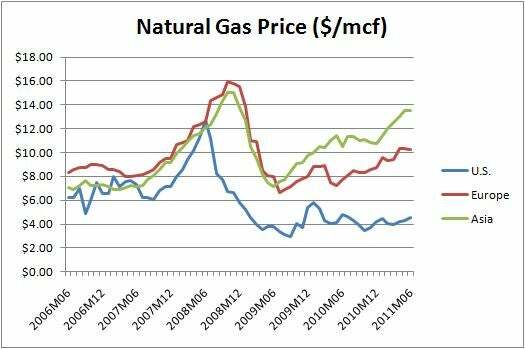 This has pushed down the price of natural gas to a very low $4.2/mcf, below many producers price of production. The low prices in the U.S. are a stark contrast to the rest of the world. Source: World Bank Commodity Price Data (Pink Sheet). So why don't U.S. companies just sell to Europe and Asia? To ship natural gas, you need to cool it to -260 degrees Fahrenheit so it becomes a liquid (hence the name, LNG) and can be safely transported. The problem is, while the U.S. has receiving terminals, we have no liquefying terminals. At a rough cost of $5/mcf to liquefy and transport to Asia, it formerly made no sense for North American producers to ship it, as they were better off selling gas on the continent. International markets offer large long-term growth for the U.S. natural gas business. While Asian natural gas plays like InterOil's (NYSE: IOC ) Elk and Antelope fields in Papua New Guinea will be able to meet some demand, Global LNG demand is expected to exceed supply under construction by 2017. So what's happening in the U.S.? LNG in the U.S.The only exporting plant in North America is ConocoPhillips' (NYSE: COP ) Kenai LNG plant in Alaska. The plant is in the process of being shut down as natural gas supplies in the Cook Inlet basin area have been falling. The problem was recognized years ago, and a pipeline was considered to connect the area to the main North American pipeline network, but the investment was never made, so no out-of-area natural gas can be processed there. In the U.S. there are two large projects in the works. Freeport LNG is owned by Michael Smith, ConocoPhillips, Dow Chemical (NYSE: DOW ) , and other partners. It is targeting a July 2015 start date and is expected to have a capacity of 1.4 Bcfd. The project open to regular investors is Sabine Pass LNG owned by Cheniere Energy Partners (AMEX: CQP ) with the general partner being Cheniere Energy (AMEX: LNG ) . The company currently runs a 4.0 Bcfd receiving terminal with half its capacity contracted toTotal and Chevron with Cheniere Energy, taking the rest for themselves. The company plans on building a 2.6 Bcfd liquefaction plant so it can both import and export LNG. Targeting a 2015 start date, Cheniere Energy's shares got a boost in May when the Department of Energy approved its application to export LNG. So why is this a game changer?Assuming roughly $5 to liquefy and ship, compared to selling natural gas to consumers in the U.S., 4 Bcfd of natural gas liquefied at Sabine Pass and Freeport LNG and sold in Asia at $14/mcf will allow natural gas producers to earn an extra $20 million a day, or $7 billion a year! This would made it possible for natural gas companies to thrive, compared to now, when they are selling gas below their cost of production in many cases. Dividends!While Cheniere Energy Partners pays a large dividend of 9.4%, there is a better way to invest in the growth in LNG and still reap large dividends. I'm talking about LNG shippers. LNG shippers will profit from the growth in LNG no matter where it is, and unlike Cheniere Energy Partners, they are not dependent on one complicated project working out. The two you can invest in are Teekay LNG Partners LP (NYSE: TGP ) and Golar LNG Ltd.(Nasdaq: GLNG ) . Golar LNG owns four floating storage and regasification ships (floating LNG receiving terminals), which are under contract till the end of the decade. The company also owns six LNG carriers. The stock has taken off this past year, rising some 300%, and as such, the company only yields 2.8%. The stock I like is Teekay LNG. The company is a pure shipper, providing marine transportation for LNG and crude oil under long term contracts. Over the past five years, it has grown from four LNG carriers and five tankers to 21 LNG carriers, five LPG carriers, and 11 conventional oil tankers. The company is organized as an MLP and has increased its distributions at an 8% CAGR to $2.52 per share last year for a 6.7% yield. The company is well-positioned to grow with the LNG market, wherever that may be.